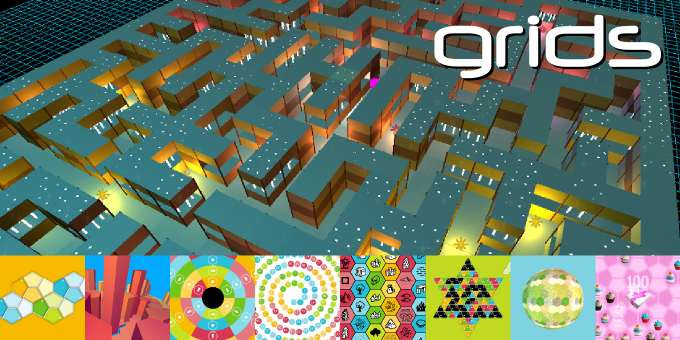 Grids 1.9 is now available in the asset store 🙂 For this most part, this version fixes some bugs and makes a few design tweaks. We are also building a free Unity package with some extension methods and lightweight utility classes. These are now included with Grids. Among others, there are extension methods for transforms (SetX, RotateXY, ScaleLocalZ), Vectors (for projection and rejection), Colors (Lighter, Opaque), and a generic singleton and lightweight state machine class. Added custom shapes for all basic, non-polar grids in the editor. Slightly changed the design of LayeredGrid and LayeredPoint to make them more re-usable and robust. Fixed the position of gizmo labels for polar grids. Fixed a bug that caused null pointer exceptions in interactive grids with null cells. Fixed a bug with cell dimensions in hex grid builders that caused bugs when used with non-regular hexagons. Fixed a bug that caused editor code to be called in builds. Fixed a bug with Pointy hex shapes in the editor(fat and thin rectangles were swapped). Removed the ToolTip and Description attributes (which implemented built-in functionality).